Belated Happy 4th of July! We had family here from CA for the weekend, it was great to see them and we had a wonderful time! SHEEP! That's were I left off, here are some pictures! Gotland - a rare breed this side of the pond, all Gotlands in the US are cross breeds, but these happened to be (I think he said, Mim correct me if you remember) 84%. 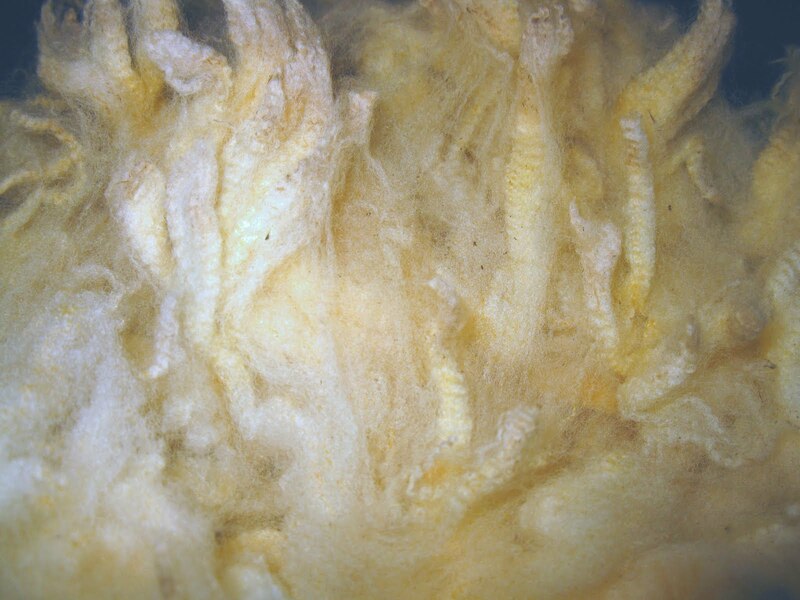 BFL - oh sooooo soft! I met this guy last year at OFFF, (blog post is here), as a ram lamb and claimed his fleece then, I got to watch them shear him on Sunday. Wow, there was a lot of fleece on that boy! If you don't know the story about Jacob sheep, you need to read it. Especially if you are a biblical history buff. I don't know if you can see his fleece, but there was a sign on the outside of his pen telling people not to reach into the pen because the horns can be painful.... guess what I had to do... shhhh, don't tell the owner, k? And this is my hat mentioned in the first Fiber Overload post! Laura is a knitter/designer and does such beautiful work! The white wool in this hat is from Babs, my Suffolk/Dorset cross ewe. I am.... A KNITTER! lol I found this pattern at one of the booths and decided I had to make some booties for Joy. I followed the newborn baby pattern, as it's written (these are too small for Joy), and am now working on a larger pair. Ok, so who out there is going to throw the first stone!?!? Hmm? Which of you spinners is going to do it?? lol Yeah, I know, not a one of you can say 'no' to a nice fleece. Sigh. I can't either. I went to the wool show on Friday, where Judith MacKenzie McCuin was judging fleece this year for BSG. I spied a fleece right off the bat that I couldn't live without and when it came time to buy on Sunday, Mim and I had our battle plans all mapped out! I would go for the black Wensleydale (OMGosh! It was gorgeous! ), and Mim would head for this (below) Romney. Well, as soon as I entered the building I had my eyes on the table with the Wensleydale (OMGosh! Did I mention it was GORGEOUS!!) but when I got there it was .... sniffle... gone! No one came close to that table, I know, Mim and I were right up at the front of the line (I stood there for an hour and a half. Yeah, I know) so even though I missed my Wensleydale (realized later that the volunteers get first choice, and saw the fleece sitting alongside a wall. hmmm, thinking of volunteering next year :) I did get two beeeutiful fleeces! This is a Romeldale CVM cross, right up my alley. This fleece didn't place; Judith is one tough cookie! I still haven't figured out why it didn't do well, it is sooo soft, no breaks, very consistent. The only thing I can figure is the tips are just slightly cotted. It works up beautifully though! This is from my nekkid ram above. I left 3.5 lbs of it at Mim's house (I took the train to Reno and it was a toss up as to whether they would let me on the train with all my.... stuff) and she is going to order some bamboo to put with it and I will pay her for that and the shipping to Morro... soon. And this? I am more excited about this than anything else I bought at BSG. I started knitting because I want to learn how to knit lace. I also lovelovelove qiviut! The first half of this book is dedicated to the discussion of the Oomingmak Co-Op in Anchorage, AK and the Musk Ox that delivers the super fine fiber that spinners drool over and the knitted fabric that rich people hoard. This is my absolute favorite fiber to spin and although there was a booth there that had qiviut roving for $30 an ounce (gulp!) it was not in my cards to get it then. Normally qiviut sells for $25 an ounce raw! The price was astounding and if I'd found it early on in the weekend, I might have walked out with a few ounces.... C'est la vie. Great pics of the sheep (mmm Gotland) and that Romney fleece is so shiney and pretty...drool. Your baby booties are so cute! 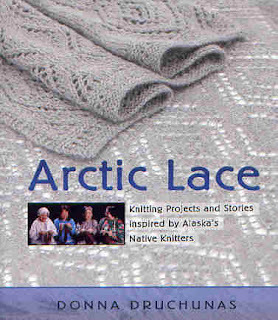 Funny, I just bought that same book...Arctic Lace. My Qiviut roving was $40 Cdn for an oz. You know you are always welcome to stay at my house!! It was truly fiber overload - I'm still recovering! I'm so happy to hear you've become a knitting convert. I love to knit and hope you will too. Your fleeces are lovely - saw Mim's part. Just yum. The fiber pictures are so pretty ,I can almost smell them. A fun place to be it seems. I am knitting a lace tunika for my grandchild Alette.Lace is new to me,and all the counting is a bit to do.But I wanted a airy light feeling to this piece and the lace is giving me just that.Take care!